It's hard to forget the first man you fell in love with. Your dad is just that special, right? Father's day is on Sunday, June 16. Show the guy who taught how to hold a fishing pole, held your bike handles when you were learning to ride, and tried (unsuccessfully) to do your hair the day of school pictures, just how special he is with a unique and thoughtful gift. It's hard to forget the first man you fell in love with. Your dad is just that special, right? Father's day is on Sunday, June 16. Show the guy who taught how to hold a fishing pole, held your bike handles when you were learning to ride, and tried (unsuccessfully) to do your hair the day of school pictures, just how special he is with a unique and thoughtful gift. We’ve rounded up a few gift ideas for our Healthy Father's Day Gift Guide that'll make the sports enthusiast, groomer, or traveler in your life happy this June 16. Guys need to get pampered too. Dull razors and sensitive skin can leave skin rough, cracked, and bumpy. 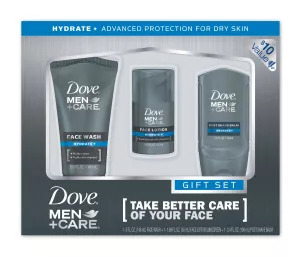 Gift your dad with Dove Men+Care’s new line of soothing—and smoothing—grooming products, Face Range. The line includes a facial cleanser, shave gel, post-shave balm, and SPF moisturizing lotion. Their special Father's Day gift set (cleanser, lotion, balm) is $10. Along that same line, their razor should be fresh and sharp, to make the most accurate shave, to prevent knicks and cuts. The guys behind Dollar Shave Club developed a monthly razor subscription, with three purchase options: $1/month for 2 blades and 5 cartridges, $6/month for 4 blades and 4 cartridges, and $9/month for 6 blades and 4 cartridges. This lightweight, thin exercise band tracks your calories burned, distance, and steps, all at once. 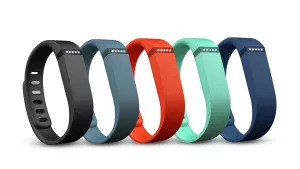 It will even tell you if you’re getting enough zzz’s by tracking your sleep cycle at night and waking you up with gentle vibrations at your “desired” wake-up time. Can’t decided between a set of golf clubs and grilling gear? Get the best of both worlds. 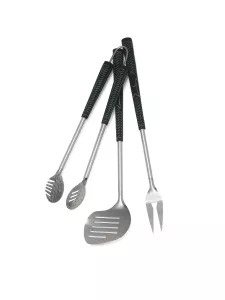 This barbecue set, including a spatula, fork, and tongs, is equipped with insulated “golf grip” handles. You’re getting a hole in one with this barbecue set! Hungry men can often jump the gun when it comes to grilling. Make sure your burgers, steaks, or ribs are completely cooked by using a meat thermometer. 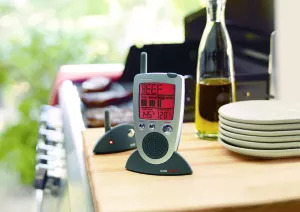 The Brookstone Grill Alert Talking Remote Meat Thermometer contains a wireless chip that tracks your selected meat type and preferred cooking temperature and announces when it’s ready. Whether your dad is a hockey, baseball, soccer, football, or basketball fan, it’s always fun to take those couchside seats and transfer them to the nearest stadium or arena. And, you don’t have to spend a fortune doing it! StubHub.com is a discount ticket website where you can buy seats for lowered prices, even the day before. Is your dad still using a thermos to transport his coffee? Update his mug with a Bodum Travel French Press Coffee Maker and Mug for 15-ounces of strong coffee on the go.